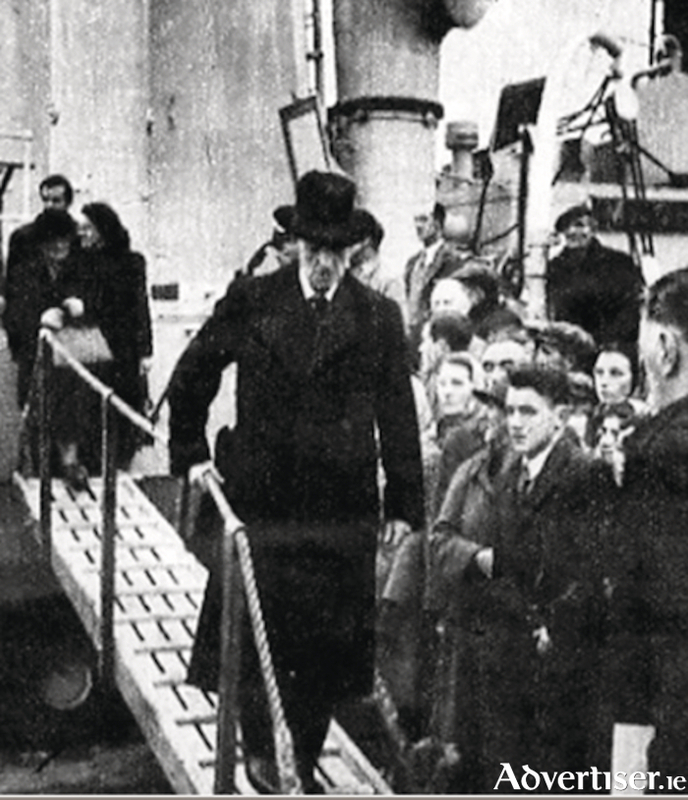 The LE Macha arrives in Galway: The poet’s brother Jack B Yeats is embarking, while waiting at the top of the walk-way are Mrs George Yeats, her son Michael and daughter Anne. Kathleen B Curran, who began working for the Galway Harbour Board after she left school, would rise spectacularly through the ranks to become the combined Harbour Master and secretary to the Port Authority (an unheard of position for a woman in Ireland ). She was intimately involved in all of the major events which the harbour witnessed during the latter part of the last century. But I am sure she took particular pleasure, as an Irish language enthusiast and a great admirer of the poet WB Yeats, when Galway was picked out to play a role in the great poet’s funeral. On the morning of September 17, 1948 the body of W B Yeats was brought ashore at Galway docks. Yeats had died at the hotel Idéal Séjour in Menton, on January 28 1939, at 74 years of age. Because of the war it was not feasible to return his body to Ireland before then. He had suffered from a variety of illnesses in his later years. But the mild climate of the south of France soothed him. He worked right up to the end, and often discussed his death with his wife George (Georgie Hyde-Lees ). He told her that if he died in Menton she was to ‘bury me up there (indicating the local graveyard at Roquebrune ), and when the newspapers have forgotten me, dig me up and plant me in Sligo.’ Now, nine years and World War II later, the time for that ‘planting’ had come. The Irish Government fell over itself to give the great man the honours he was due. It offered to give the poet a full State funeral, but George insisted that it was to be kept as simple as possible. She agreed, however, to a guard of honour; and in order to get the body home, she accepted the offer of help from the Irish Navy. It was agreed that because there was no deep harbour in Sligo, the poet should be landed at Galway. It was a mission not without its pitfalls. On August 25 the corvette LE Macha, under Commander D McKenna, departed Dun Laoghaire on its way to Nice. It was the first time the Irish Navy had been outside territorial waters. The ship made a brief courtesy stop at Gibraltar, where Commander Mc Kenna had to apologise that no official ceremony could be made ‘with swords’ as they hadn’t any. The Irish ambassador Seán Murphy, and his attaché, flew ahead to Nice to oversee the arrangements. His plane crashed on landing, but luckily no one was hurt. Meanwhile Yeats’ coffin rested in the little cemetery chapel waiting for collection. It had been there for some months, after a fearful kerfuffle and worry that possibly the wrong body was patiently waiting to begin its journey to Ireland. When Yeats died in 1939, 79 years ago, George paid for a 10-year concession on her husband’s grave site overlooking the sea. The ‘temporary’ grave was simply marked: W B Yeats, 1865-1939. She then returned quickly to Dublin to deal with the family, her husband’s affairs, the queries from the press, and to organise memorial services in both Dublin and London. But now, nine years later, in preparation for the re-interment, it was discovered that the graves in that section of the cemetery had disappeared. Local officials explained that there had been fighting around the village, and that in the confusion all burial records had been lost. It appears the bodies were reburied in an unmarked section. There was a genuine fear that Yeats’ remains could have been mixed up with the remains of an English man, Alfred Hollis, who was buried nearby only days after WB had been laid to rest. However, following an exhaustive search by the French authorities, and the presentation of physical evidence by Yeats’s family, the poet’s son Michael was satisfied that his father’s remains were correctly identified. Embarrassed by the mix-up, the French now put on an elaborate display. Yeats’ coffin, draped in the Irish tricolour, was carried into the village square. There were speeches by the mayor and local dignitaries, and a poem by a local poet. A guard of honour, and a military band (with additional side drummers and trumpeters ), accompanied the coffin to the waiting corvette at the Nice quayside. Ships’ horns and whistles blew as the LE Macha ploughed through the bay on her way home. It arrived in Galway in the early hours of September 17 1948. An Irish military guard of honour stood by. Yeats’ widow George, his son Michael and his daughter Anne, and his brother, the artist Jack B Yeats, were immediately welcomed on board. The family spent a few minutes with the coffin, before it was carried to a waiting hearse. His great muse and inspiration Maud Gonne (described by the artist Sarah Purser as looking, in her later years, like ‘a ruined cathedral’ ), afflicted with arthritis, remained in Dublin. She was to die five years later, but she was already immortalised in the Yeats’ legend. By a curious coincidence her son, Seán Mac Bride, then minister for external affairs, was there. Even though George had requested no State funeral, she recognised and appreciated Mac Bride’s presence. The link to her husband’s already mythologized past must have been very striking to everyone present. Yeats’ great biographer, Roy Foster, wrote: ‘The ceremony at Drumcliff (churchyard ) on September 17 1948, announced that WBY’s reputation belonged neither to government nor family, but to the country whose consciousness he had done so much to shape…’. NOTES: The quotes are taken from RF Foster’s WB Yeats - a Life (The Arch-Poet ), published by Oxford University Press, 2003; and Becoming George - The life of Mrs WB Yeats, by Ann Saddlemyer, published by Oxford University Press, 2002. A reference to Kathleen B Curran 1912 - 1995, from Journal of the Old Tuam Society 2017 by Mary J Murphy. Yesterday June 13 was the 153rd anniversary of Yeats birth at Sandymount, Dublin. His birthday was appropriately honoured by Coole Music’s presentation of a concert at Thoor Ballylee, in superb Medieval costume.